Eighty-four volunteers and members of the Sierra Buttes Trail Stewardship gather at the Mills Peak Trail head to celebrate completion of the trail project. It was a beautiful, mild spring day in the Lost Sierra, perfect for working on trails as 84 volunteers gathered to complete work on the final 1.7-mile section of Mills Peak Trail, connecting the town of Graeagle to Mills Peak with 11 miles of trail designated for hikers, mountain bikes and horseback riders. 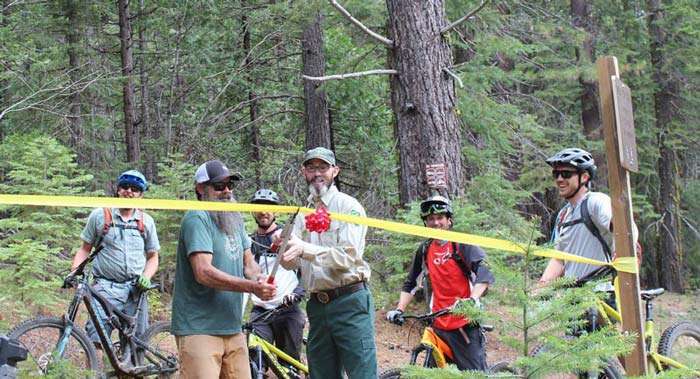 Thirteen years after the idea of the Mills Peak trail was conceived on Greg Williams’ back porch, the project is complete. 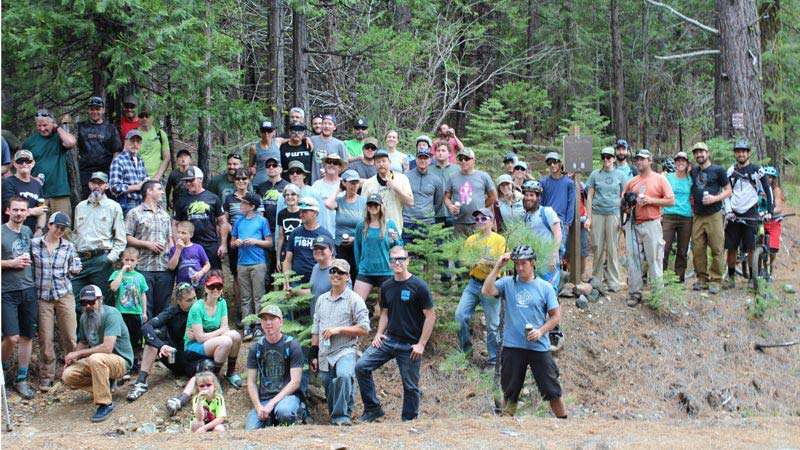 It was made possible by a partnership with the Sierra Buttes Trail Stewardship, Plumas National Forest, Plumas and Sierra counties and Graeagle Land and Water Company. 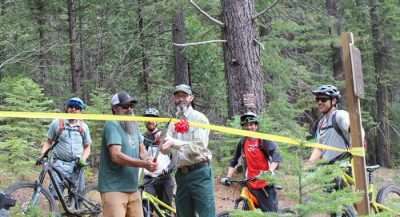 As they were getting ready to cut the ribbon, four cyclists arrived at the perfect time to be the first to ride the entire trail top to bottom. Williams stressed that Plumas National Forest staff were an absolutely vital partner in this project and it would not have been possible to complete without their help. He also thanked volunteers, funders and partners in the project before he and Jedra cut the ribbon, triggering cheers and kazoo buzz from a crowd of volunteers, ready to get out and enjoy their hard work. The trail is sure to attract visitors and boost tourism in the area, well known for miles of trails and fantastic views. Partners and volunteers celebrated by riding the trail and met later in the evening at Nakoma for drinks and presentations about the project. 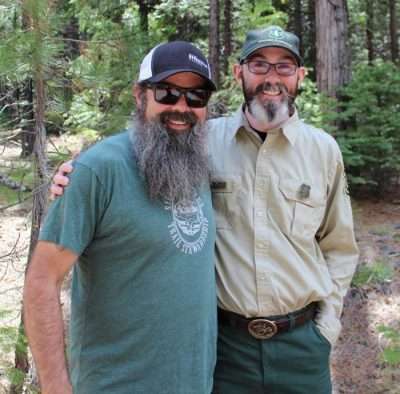 Greg Williams and Matthew Jedra were all smiles about the culmination of 11 years of work on the Mills Peak Trail project.